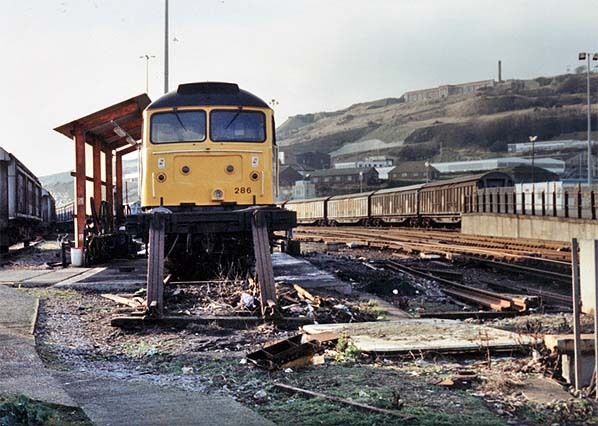 Looking west at the site of Dover Town station c1992.Towards the end of its existence a locomotive fuelling point was constructed in the Town Yard to avoid having to run locos to and from Chart Leacon depot at Ashford. Class 47 diesel 47286 'Port of Liverpool' was on the point on this day, in British Rail Railfreight Distribution livery.Vans are standing in the rebuilt Town platform in the right. The ramp on the far right is for loading cars.